Brief Synopsis – In the early days of WWII, a Canadian volunteer in the British Navy is assigned to be captain of a tug boat that is meant to help save ships from German attacks. His friendship with a fellow Officer allows him to be the recipient of a special “key” which grants him access to an apartment and the women who lives there. 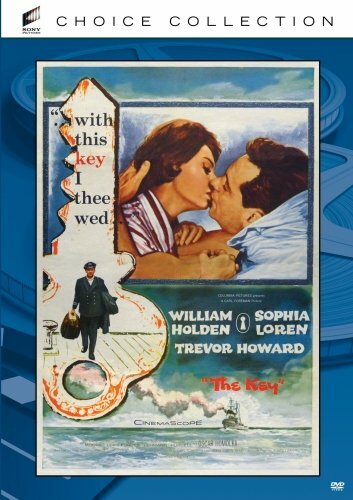 My Take on it – During the Hayes Act years, many movies in Hollywood were “warped” and needed to be changed in order to show the public that people committing unsavory acts were to be punished in some way. This made the producers change the ending of the book completely so that viewers would feel that the characters needed to “pay” for their actions. The idea that a woman was attached to an apartment being used by Officers was a very risque theme for a movie and many scenes seem to be missing that would make the viewer believe that these characters were able to fall in love and that leaves many issues completely open. I assume that the book explained these situations much better and think that this is a case where the movie could be made better today (without the restrictions of the 1950’s) and give us a better, tighter and more complete story than this one was able to do at the time. Bottom Line – Very risque type of movie for its time, but it’s hard to completely believe in the characters and their real motivations. Perhaps it is better explained in the book. Isn’t that crazy, the censure commission? The pendulum has swung completely to the other side. Immoral acts are not only normal but glorified. I haven’t seen this film–good review. As much as I like Sophia Loren, I didn’t care for this movie. Excellent review though. Yea. She and Holden were pretty much wasted here unfortunately. Tnx for commenting!